Students from IMS e.V. Institute for Membrane and Shell Technologies at Anhalt University in Germany, will pay here and will get the book at the IMS e.V. Institute in Dessau, Germany. Please Do Not Click here If you don’t study at the IMS Institute for Membrane and Shell Technology in Dessau, Germany. 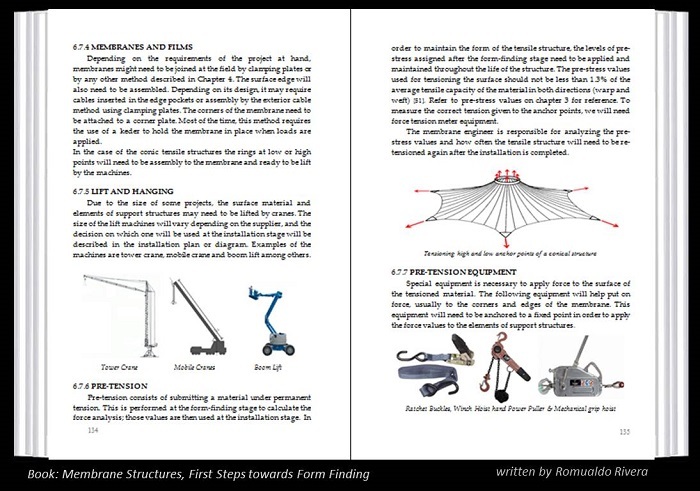 The goal of this book is to take the readers through the introduction and basic understanding of the fascinating world of membrane structures. 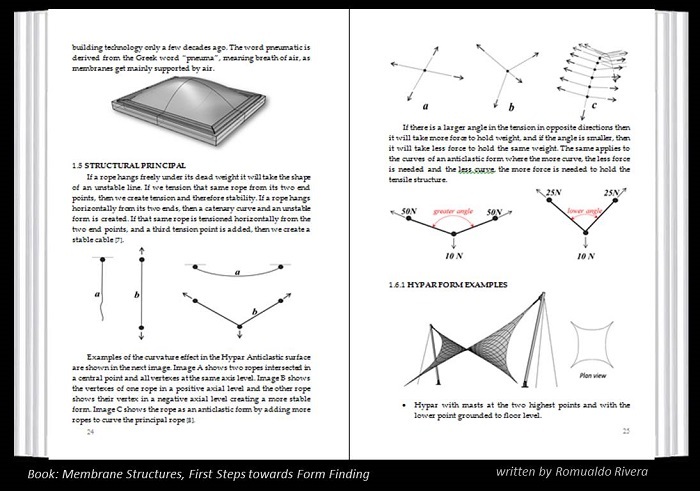 We recommend the book for beginners, it introduces students to the subject of Tensile Surface Structures. 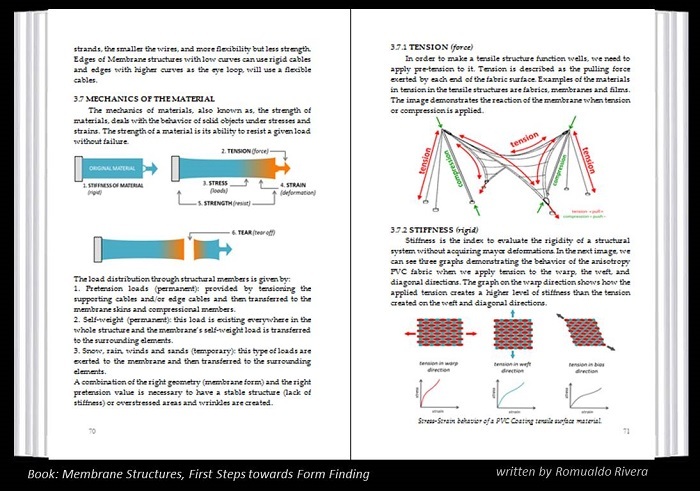 It explains how to design membrane structures by using the right structural principles. These chapters will introduce students to the Design topics: 1. 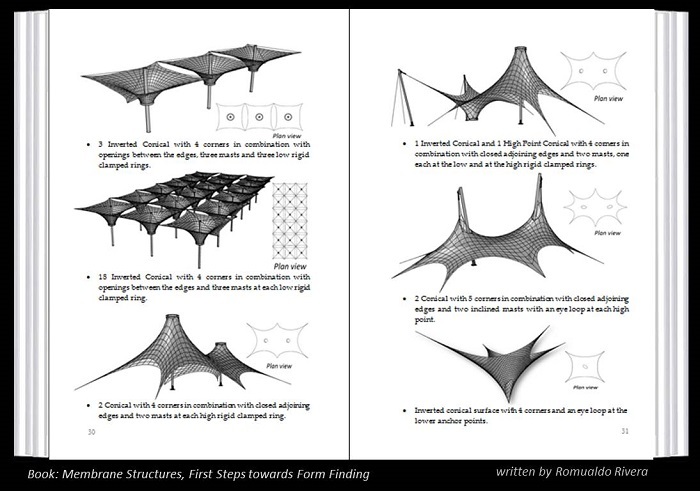 Basics on Tensile Structures and 2. Principles. Also the next chapters will introduce the readers to the subjects of: 3. Tensioned Surface Materials, 4. 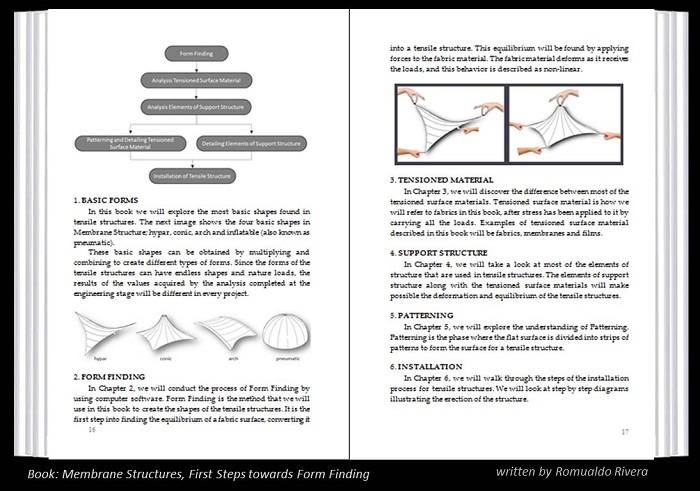 The Elements of Support Structures, 5. Patterning and Fabrication, and 6. Installation and Maintenance. The reader will find a lot of drawings and illustrations included in each chapter. 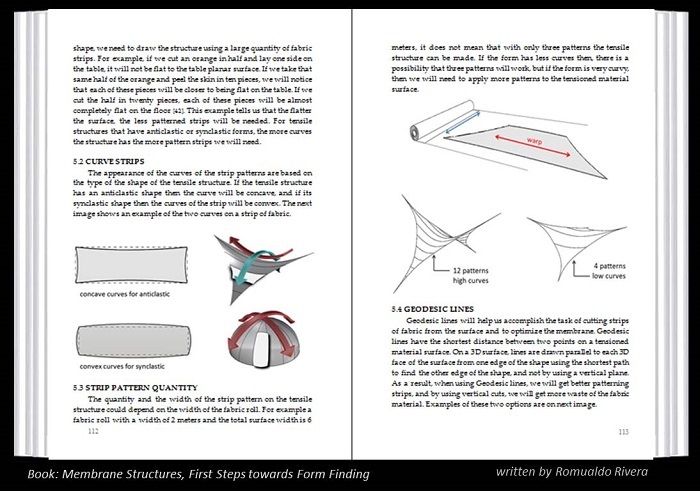 If you are new to this subject and looking for details and illustrated explanations on tensile surface structures through a design method, then we recommend this book “Membrane Structures: First Step Towards Form Finding”. Don’t buy this book if you are expecting to learn surface analysis. 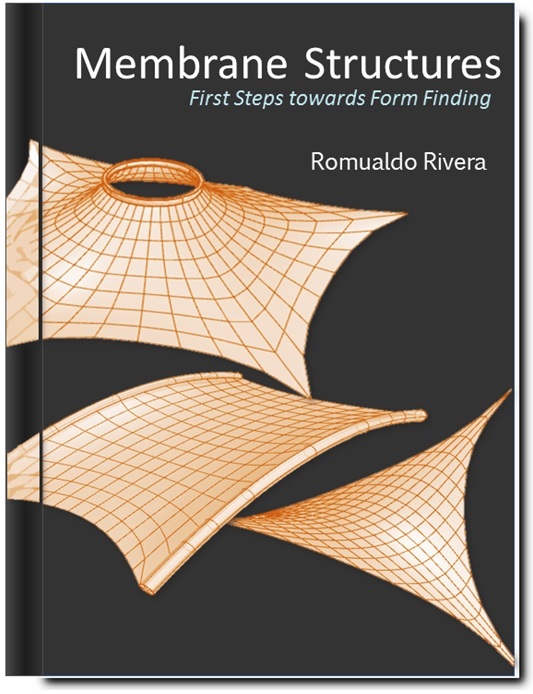 Don’t buy this book if you are expecting to learn how to use Rhinoceros, Grasshopper or Kangaroo, these are just great tools that we used to explain the used of Form Finding, but not for learning the software. 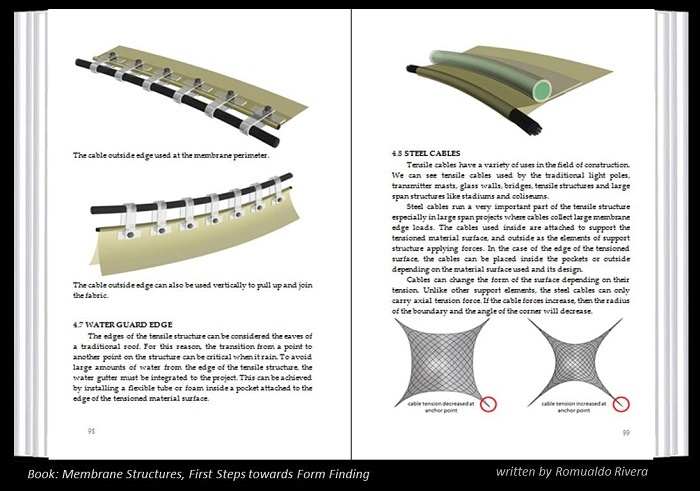 This book was written in collaboration with Raham Zarfam – PhD in Structural Engineer, Carlos Talavera – Architect & Membrane Structure Engineer, Thomas Van Dessel – M. Eng. and Caglar Ozturk – Architect & Membrane Structure Engineer.